Students identify and define the steps of the writing process: prewriting, drafting, revising, editing, and publishing. Then they work through the writing process and identify strategies used at each stage, applying the strategies as they write an expository essay. Next, they evaluate how the steps of the writing process make their writing clearer, more organized, and more engaging. Finally, students will self-evaluate based on a rubric. In this experience, students identify and define the steps of the writing process: prewriting, drafting, revising, editing, and publishing. Then they work through the writing process and identify strategies used at each stage, applying the strategies as they write an expository essay. Finally, they evaluate how the steps of the writing process make their writing clearer, more organized, and more engaging. The writing process is the steps an author follows to create a well-written piece of writing. In this experience, you will learn the steps of the writing process while writing an expository essay. You will improve your writing by identifying and applying the steps of the writing process. People all have different natural talents. Some people are natural athletes, and others have to work at sports to develop athletic skills. Some people are born with a musical ear, and others have to practice for years to become musicians. Some people have a natural talent for language, and they may be excellent writers, notable public speakers, or fluent speakers of several languages. Writing is like other skills—even if it doesn’t come to you naturally, you can learn skills and strategies that will help you become an effective writer. How do you think writers might become good at writing? Use student responses to start a discussion. Writing well ensures that your message is communicated to others. If you don’t write clearly, the reader may interpret your message incorrectly. Good writers have a plan for their writing and communicate their ideas in a clear, organized, and engaging manner. 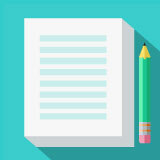 In this experience, you will learn more about how you can use the writing process to create a well-written essay.